Here's an amazing opportunity: submit your design to the Swatch Art Rules competition for your chance to win a trip to Los Angeles, an all expenses two week holiday to New York - and see your design on a watch sold around the world! Cristales by Marco Fragozo Mejia of Afghanistan. Shapeshifter, by Ricardo Santos of Portugal. 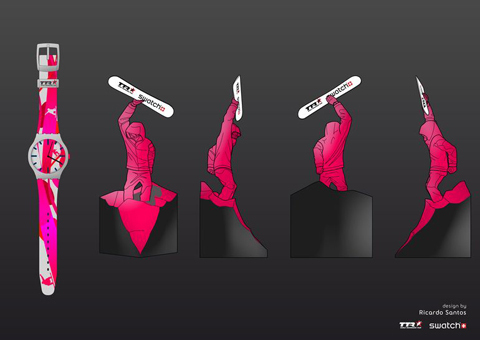 For the third time the competition is held in conjunction with the TTR World Snowboard Tour and the winning design will be featured on the 2012-13 trophy as well as on the matching Swatch Tour Watch, which will be distributed worldwide. 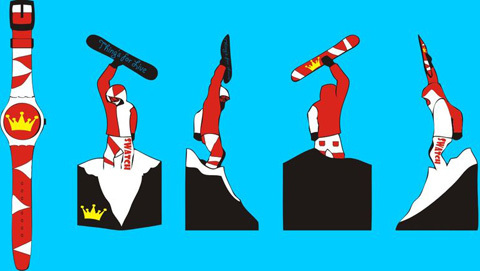 The TTR trophy is one of the most coveted awards in the world of freestyle snowboarding, and is presented to the champions live on stage at all the biggest events in the sport. Momentous Celebration by Peter Cheok of Malaysia. Things for Life by Eduard Ganahi of Austria. 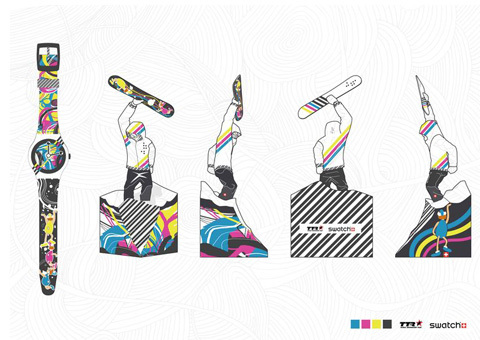 This year the theme for the watch is Progression and Style, which are both key elements of snowboarding. The jury of snowboarding experts is joined by Romain Colin, otherwise known as Fubiz – the acclaimed French blogger whom I met during my trip to Venice with Swatch late last year – who will judge the final designs alongside the supremely knowledgeable president of Swatch, Madame Emch. The top three nominees will also be invited to Los Angeles during May 2012, on a trip of a lifetime to discover which design will be unveiled as overall winner. I was also invited to LA to cover the event, but I am gutted because I will be too busy with my new baby to come along. I cannot tell you how jealous I will be! And I hope that at least one of my readers will be one of the lucky ones to make this trip. Pixel Attitude by Joyce Liew of Singapore. Ice and Fire by Marco Magni of Italy. It’s possibly a little known fact that I am a keen snowboarder – I spent three seasons working in the Austrian Alps during my 20s, and returned a few winters ago to snowboard the slopes of Val d’Isere. It’s one of my great loves – oh how I miss whooshing down those immense powder runs on a beautiful crisp morning – but even if you aren’t a snowboarder yourself this is a great opportunity to get involved with a fabulous brief that will give the winner worldwide exposure. 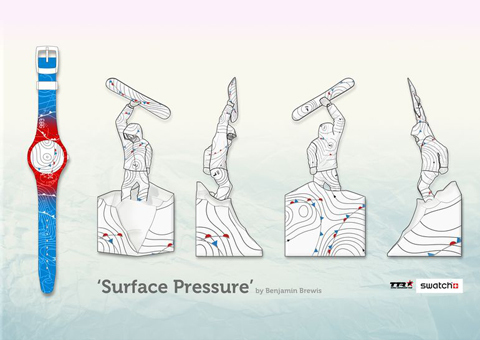 Surface Pressure by Benjamin Brewis of the UK. Colorhood by Marili Nikoli of Greece. I’ve included a few of the current entries here for your perusal – to see more examples of the entries that have already been received check out this link. 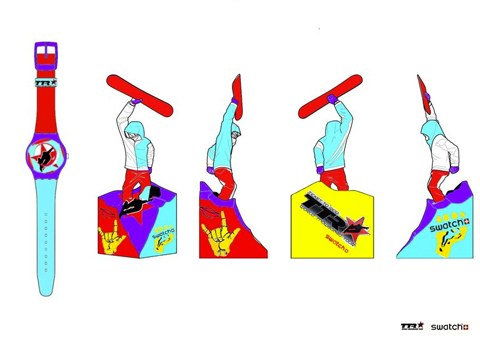 You have just a few weeks in which to submit your designs, for the competition closes on March 27th 2012. If you are submitting some artwork then please also send your submissions to me (not just to me though, that would be a bad idea!) as I’d like to upload my favourites in a future blog post for all my readers to enjoy. I look forward to seeing your work online, and hopefully on the winning Swatch Tour Watch. 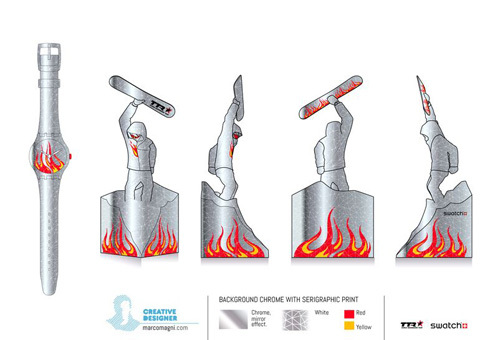 Watch a video about the choosing of the winning design in 2011 here. 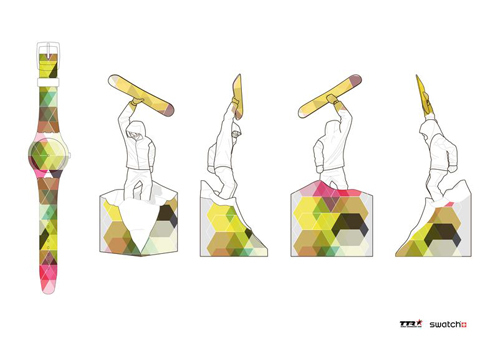 Last year Chi Fong Leong (a Central Saint Martins student) won, so what are you waiting for? 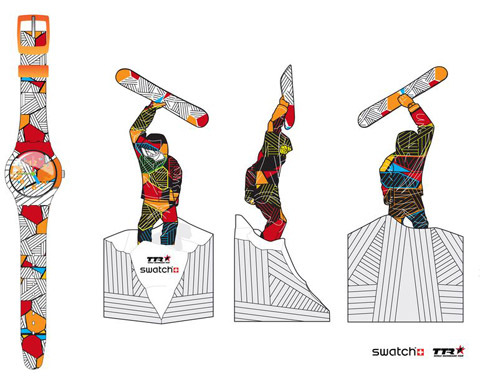 Find out all you need to know at the Swatch Art Rules website.